Seeing Micah for the first time in years, fifteen year old Eden wants nothing more than to run and hide, but instead in a moment of sheer embarrassment, she throws her arms around his neck; unaware she just changed her childhood friend forever. With eyes' opened to the realm of angels and demons, Micah discovers he has become the Seer, called to save the world from an impending fire. Shy and awkward, Eden stumbles through high school clueless her guardian angel shadows her every move, keeping her safe while she unknowingly awakens others to their spiritual gifts. Micah will need those Eden touched to complete his mission which began long ago in the ancient City of Enoch and its secret underground temple. With angels and demons fighting around them, both Eden and Micah must find their own personal courage and faith in order to know what to do for the battle that awaits them, one they must triumph or risk losing everyone they love. Born in Dekalb, Illinois, Amanda Strong has called Utah, Arizona, Hawaii, Virginia and now New Mexico home. Amanda has been spinning tales since she was a child. Her family still remembers finding young Amanda with her bright pink glasses, hiding in random corners of the house while scribbling away in one of her many spiral-bound notebooks. You could say that some things never change since Amanda is still writing today. Amanda began her writing career when she uploaded The Awakener, her first full-length novel, on Wattpad where it received over 430,000 reads in four weeks. She was blown away and humbled by the reader support and feedback she received. Because of The Awakener's success as a non-published book, she was asked to talk on 1400 KSTAR about her story. In September 2013 Amanda Strong signed with Clean Teen Publishing for publication of The Awakener, which is scheduled to release in late October of this year. 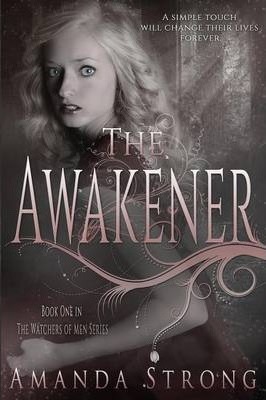 The Awakener is the first book in an all-new young adult paranormal romance series called: The Watchers of Men. When Amanda isn't writing, you can find her chasing her three rambunctious children around the house and spending time with her wonderful and supportive husband. On some occasions you can still find Amanda with her not-so-pink glasses, hiding in a corner reading her favorite young adult fantasy novels or working out only to blow her diet by eating ice cream.